Using natural materials and your stash of craft supplies, many options exist for creating a personalized Halloween office environment. Choosing a theme helps you create an artistic arrangement and avoid the clutter of a hodgepodge of objects. Decide which surfaces are available to decorate. Read the office guidelines and ensure your decor doesn't interfere with your work or annoy your coworkers; avoid noisy objects, blinking lights and other distractions. If you have magnetic or glass vertical surfaces, the weight of some objects, such as wreaths and heavy hanging decorations, probably won't work. Make lightweight paper decorations; use old dictionary pages and black acrylic paint to create Halloween silhouettes of crows, jack-o'-lanterns and other icons. Add another layer with die-cuts and vintage Halloween postcards punched with holes, tied together at the upper corners to make pennants and garlands. Display a collage of photos of past Halloweens with costumed family and friends in a frame or hang them on a twine "clothesline" with small wooden clothespins. Add autumn leaves and scrapbook paper tags for variety. Make a Halloween tree using a small freestanding pot, jar or urn; cut dry florist foam to fit inside it. Add the foam, tape across the top to anchor it in the pot, and top with dry Spanish moss. Push bare twigs into the foam, and add color by scattering fall loves around the base. Show your personality by clipping old photos or Halloween ephemera to the twigs with aged clothespins or tie them on with twine or raffia. Add texture and color to your arrangement by tying on a few ribbons and more autumn leaves if desired. Another option is to create a low-profile tree with twisted brown kraft paper or a bundle of tall sticks secured to the wall with twine and pins. Decorate the branches with Halloween cutouts, owls, black cats, paper leaves, bats, crows, paper lanterns, children's artwork, pirate flags and other decorations. Spray paint an old birdcage black and hot glue a crow or bat inside it. Add a bit of Spanish moss and a small pumpkin. Tie strands of black or Halloween ribbon and a spider on the top. 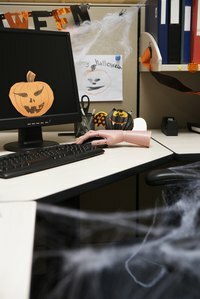 Explore alternative decorating themes for your cubicle decor such as Hollywood favorites: classic monster and fantasy movies and shows. Print black-and-white photos from the Harry Potter movies, The Addams Family and the Wizard of Oz; take them to a print center to have them blown up and printed poster size. Create a steam punk jack-o'-lantern by painting a faux pumpkin with metallic acrylic paint and outfitting it with a face made of metal embellishments hot-glued and wired on. Add old clocks, Victorian apothecary jars and printed and framed Edgar Allan Poe poems, such as The Raven. For a nautical or pirate adventure, decorate with old ship items such as fishing nets instead of spiderwebs, crabs painted black instead of spiders, orange and black seaweed, and sea stars. Old lanterns, tattered pirate flags and rusty metal anchors add a creepy air. Have your favorite phrases blown up and printed inexpensively as gray-scale posters or cut out of black vinyl letters that can be installed and removed easily. "Don't make me call the flying monkeys," and "no one gets in to see the Wizard; not nobody, not no how" are instantly menacing and humorous. Add a pair of old shoes sprayed with adhesive and covered in red glitter and an old basket with treats. Printing a text greeting such as "Happy Halloween" on a black chalkboard from a craft store is another way to express your Halloween sentiment and spread the word. String garlands of autumn leaves on twine and hang them across the chalkboard.